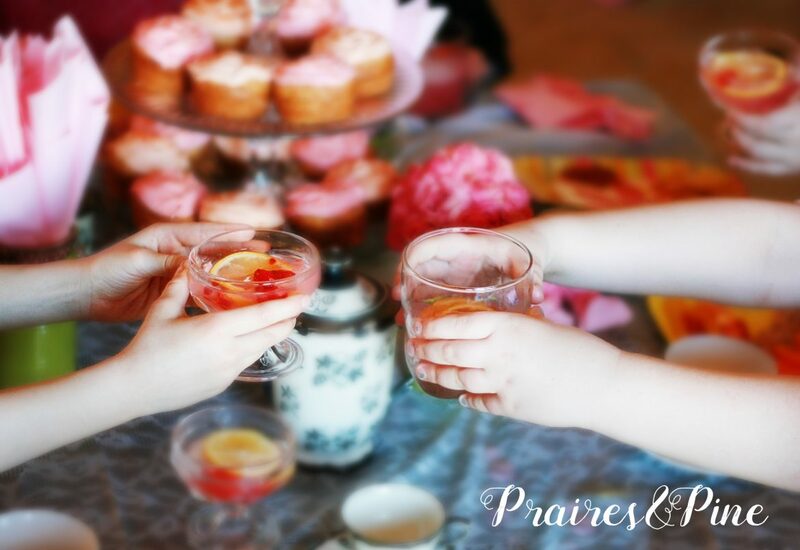 When you are turning eight, what could be more fun than celebrating with your girlfriends over a warm cup of tea and a plate full of treats? 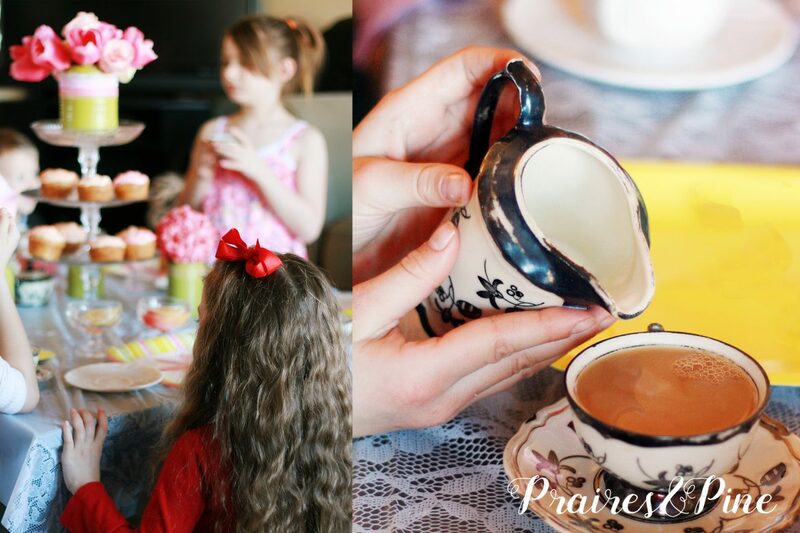 The party planning for my daughters Indoor Garden Tea Party began when I found a stunning antique Tea Set on Craigslist for $10. The Tea Set came with petite cups and saucers that were perfect for little hands. 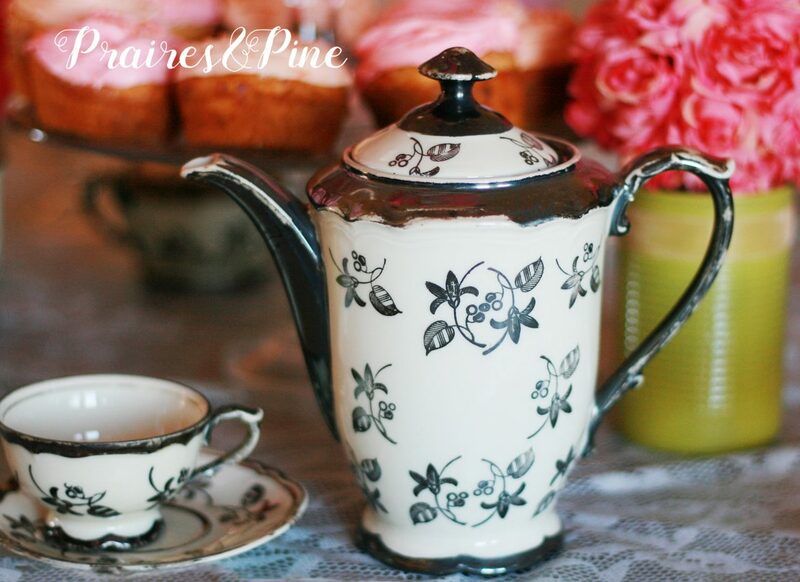 The next tea party planning step involved creating an affordable centerpiece for the tea table. 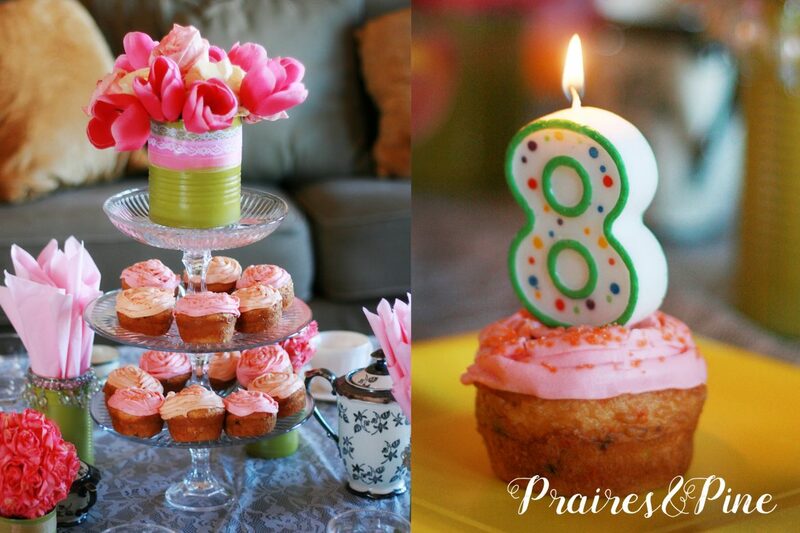 After much research, I discovered that you can make YOUR OWN cupcake stand using glass plates and E-6000 glue. I was surprised with how easily my DIY stand went together. I used three glass plates and three glass candle sticks that I picked up at the Dollar Tree. I glued the plates to the candle sticks, put a heavy book on top of the stand to weight it down, and let it dry over night. Total cost for this awesome washable and totally reusable cupcake stand was only $6! Since I was following a garden theme I decided on pink and green for my color scheme. 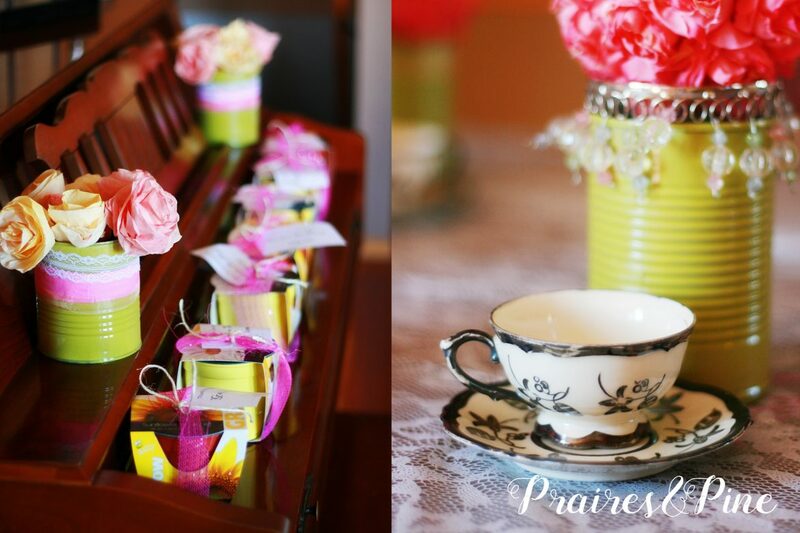 I spray painted some recycled tin food cans and used them for flower arrangements and napkin holders. To give the feeling of being in a garden gazebo, I hung strings of paper flowers, pink gauze and green streamers in the shape of a tent over the table. The paper flowers were actually made out of coffee filters that I dyed with food coloring. FAB DIY has an awesome tutorial on how to make these: http://www.fabdiy.com/diy-beautiful-coffee-filter-rose/ To create the flower strings I glued paper flowers onto some garden twine that I bought for $1 at the dollar tree. The table center piece also included a bouquet of coffee filter roses and some tulips. These paper flowers are a little time consuming but the overall effect is totally worth it! For party favors I bought each girl a seed starter kit that they could grow at home themselves. Since it was an afternoon party, the food menu was light. 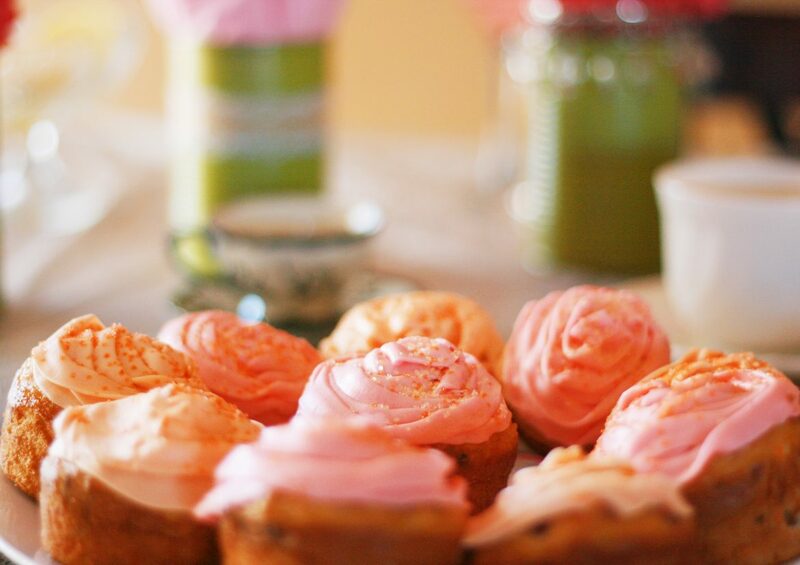 I baked some cupcakes and decorated them with home made buttercream frosting dyed pink and peach to match the colors of the paper flowers. 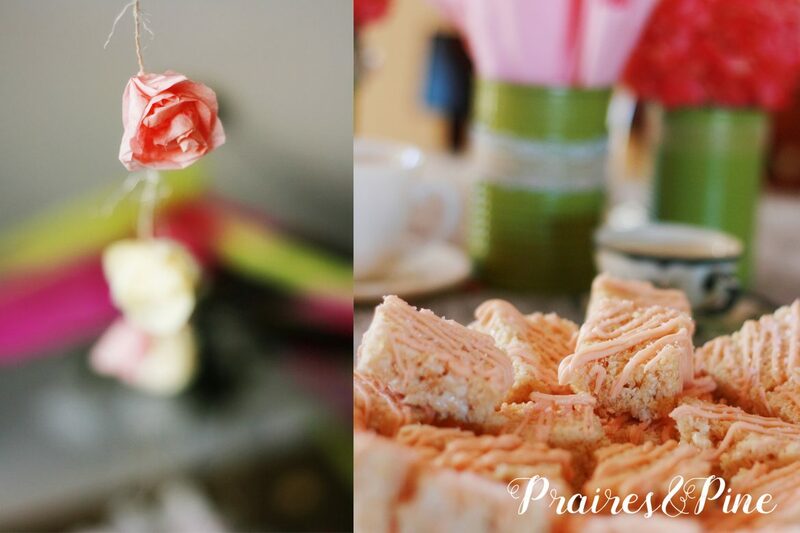 I also made rice crispy treats that I drizzled with peach colored almond bark…these were a huge hit. There was also some healthy food to snack on like seasonal fruit and veggies. I made some pink lemonade and put strawberries and lemon slices into the cups for added color. The party guests, loved these fancy drinks! 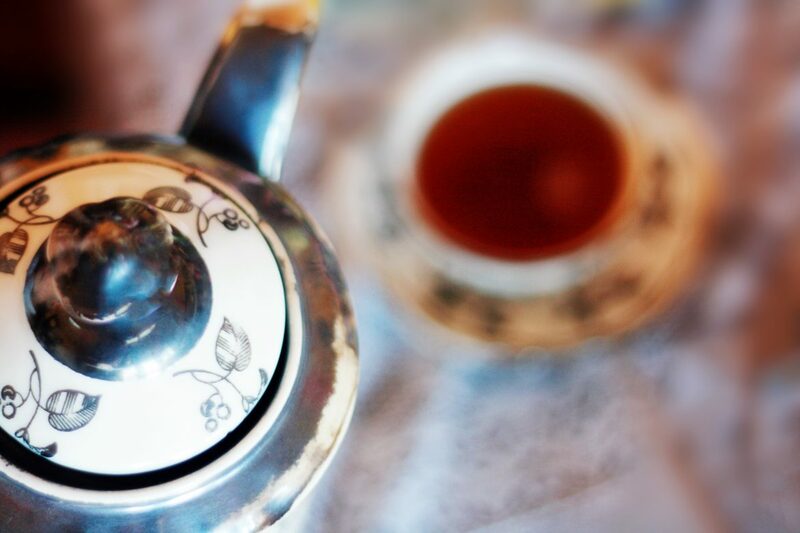 Of course you can’t have a tea party without real tea, so I brewed some good old fashioned hot English black tea and filled the tea pot. The girls poured their own tea and stirred in their own sugar and milk. Of course most of them ended up with more sugar than tea, but I think that was probably their favorite part of the party. Overall the girls had a blast and I felt like a winner because I had come in under budget. 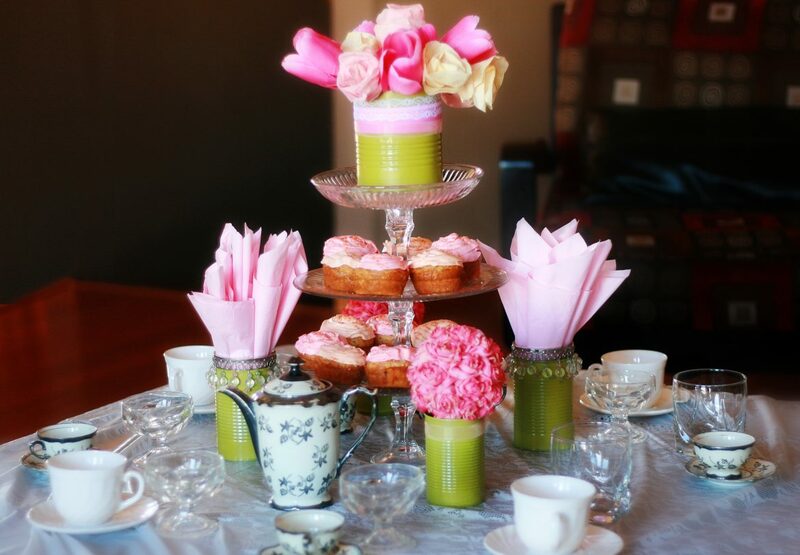 Total cost for this party was around $60, which included a reusable tea set, cupcake stand, and glassware. You don’t have to break the bank to throw a party, you just need a little creativity and effort. A smile like this from the birthday girl made all that party prep totally worth it!